Animation effects in PowerPoint provide smooth visual transitions between different states of your presentation by moving objects in place or around the slide canvas. Motion evokes the most basic human instincts and naturally attracts the attention of the eye. Used well, animation makes the viewing experience engaging and dynamic. The main idea of using animations is not just to make content interactive and entertaining, but also to draw viewers’ attention to the key points and therefore express ideas in a more memorable way. There are plenty of animations in Microsoft PowerPoint that can be applied to text, shapes or pictures. Some of the most commonly used effects are: Appear, Fade in, Fly in, etc. Sometimes our imagination goes beyond standard PowerPoint animations, so we need to create a more complex, unique animation that no other presentation contains. Let’s delve deeper into both of these options, look into their variations and review some examples. A single object on a PowerPoint slide may have many animation effects applied at the same time. Adjusting the settings for each effect will create a combination that most likely will be a unique one. PowerPoint has a toolbar called Animation Pane that gives you total control over the animations on a slide. This makes creating sophisticated animations very easy with only a few clicks. To show the Animation Pane, switch to the Animations tab in your PowerPoint and click the respective button. Tip: You may also turn on Selection Pane to give distinct names to objects on a slide (Home → Select → Selection Pane). Select an object on the slide. Click the button Add Animation or select an animation from the sample gallery on the left hand side. It will apply the very first effect to the object. To apply additional animations, click the same Add Animation button again. It’s important to know that only this option will append an animation. Other methods will replace the prior animation. Right-click on a subsequent animation and select Start With previous so both animations will coincide. If you select After previous, animations will be set in a sequence. A Combo-animation has now been created! After several effects are assigned to a single object, you can see them stacked at the Animation Pane. When you select the object on a slide, all its animations will be automatically selected in the Animation Pane and the Animation gallery will indicate Multiple. Now you can control the effect options that many animations provide. For example, you can change the direction of the Fly In effect. In order to do that, right-click on a specific effect from the list on the sidebar and select Effect Options item from the drop-down menu, which will open a pop-up window with effect settings. You can also select an animation and click on the Effect Options drop-down menu right on the Animations tab. Timings can be managed right in the Animation Pane. When you hover the mouse over the green timeline for the effect, you can adjust the start time for the chosen animation. If you click the mouse on the border and drag, the duration of this specific animation will be changed. Also, you can use numeric input by right-clicking on the animation and choosing Timing. If you want the animation to repeat, e.g. an object will pulse as it moves, you can set a custom number of repeats within the same window. Note: iSpring will read infinity value Repeat: Until End of Slide as a 1 because the conversion engine cannot calculate the length of the slide, which is important to proceed. To work around this, set Repeat to any numeric value, e.g. 99, it will imitate a very long repeated action. For general purposes, a Fly in animation can be used. It will move an object to the final point from any side. However, we cannot control the starting point and trajectory using this simple animation. Applying a motion path will give you full control over object movements around the slide canvas to create precisely what you want. At the very bottom of the list you will see motion paths. Pick the one that suits your idea. Transform the path or Edit Points to make fine adjustments. If you choose Custom Path, you can draw freeform. When you are done, press the Esc button. The green spot will show the initial state of the animation and the red spot represents the final position. If you select the path itself, you will see a ghost object as shown on the picture above. You can also combine path animations with other animation effects e.g. plane may rotate as it follows the circle path. Check out the sample presentation that we made for you. Download PPT and play around with the animation settings. Now you can energize your presentation’s content by applying fluid visual transitions, making it personal and unique. Liven up your content with custom animations and iSpring will take care of converting them into Web formats. 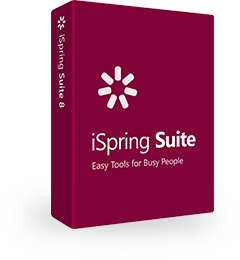 Convert your presentation with one of iSpring’s desktop authoring tools and enjoy perfect reproduction of all effects on any device.